All Systems Red is the first Murderbot Diaries novella by Martha Wells. I have always been fascinated by robots, androids, things related and in between. I now have a new favorite to add to my list - Murderbot from All Systems Red. All Systems Red is told from the point of view of Murderbot, a self-given name after an unpleasant malfunction on a previous mission. Murderbot has hacked its governor module so it's under no one's control but its own. More than anything Murderbot would like to finish its daily jobs and get back to watching some of the 35,000 hours of movies, books, etc. it has downloaded. Murderbot is both mechanical and organic with the ability to regrow and repair via the help of the MedSystem. It's a SecUnit - Security Unit - hired out to various missions to protect those who hire it. It's not a robot but an android. On this particular mission Murderbot is contracted for by PreservationAux who had bought an option on the resources of the planet they are on. This is a survey trip to see if they should bid on a share of the planet's resources. Things start to go awry when another group on the planet is killed by what appears to be rogue SecUnits. Murderbot and those it's protecting need to figure out what is going on and get off the planet before they too are killed. This is Murderbot's story and journey. Murderbot is fabulous - self-deprecating, smart, worried, and trying to find its place in the universe. Murderbot tries to pretend it's a robot so others don't want to interact with it much. Murderbot is awkward around humans and watching it interact with the humans on this mission is sometimes heartbreaking and sometimes heartwarming. Wells surrounds Murderbot with a great supporting cast some more supportive of Murderbot than others. All Systems Red is simply wonderful. Wells fits so much into this story - mystery, action, thrills, and more. The story and writing are superb with great world and character building. 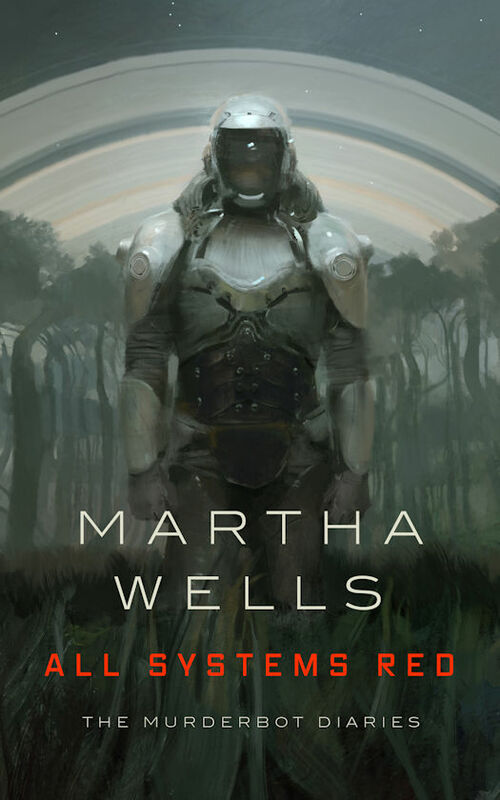 Wells has created an iconic character with Murderbot; a character who will explore the issue of what it is to be human. I am looking forward to more Murderbot Diaries. I have to say, I loved this book so much I pestered my sister until she read it too. There's just something lovable about Murderbot!